The Appalachian Trail’s route through Tennessee and North Carolina spends so much time traversing the border that it’s easier to describe as one 370 mile stretch. After crossing the Nantahala River, the Trail heads toward (and crosses) Fontana Dam (from which I took the photo to the left) before entering Great Smoky Mountains National Park. The 72-mile stretch of the AT through GSMNP generally follows the NC/TN border and includes the highest point on the entire trail, 6625’ Clingmans Dome. The backpacking here is among the best in the east, where the Trail frequently climbs above 5000’ and tops 6,000’ a handful of times. Important note: You need to obtain a permit from the National Park Service and camp only in designated campsites or shelters. The NPS takes violations seriously. If you are caught camping without a permit, you can be fined up to $5000 and/or spend 6 months in jail. After leaving GSMNP, the trail continues to flip-flop along the North Carolina/Tennessee border for about 90 miles until it enters Tennessee for good just north of Hump Mountain, near US Route 19E. From here, the Trail stays within Tennessee the final 75 miles to Damascus Virginia. 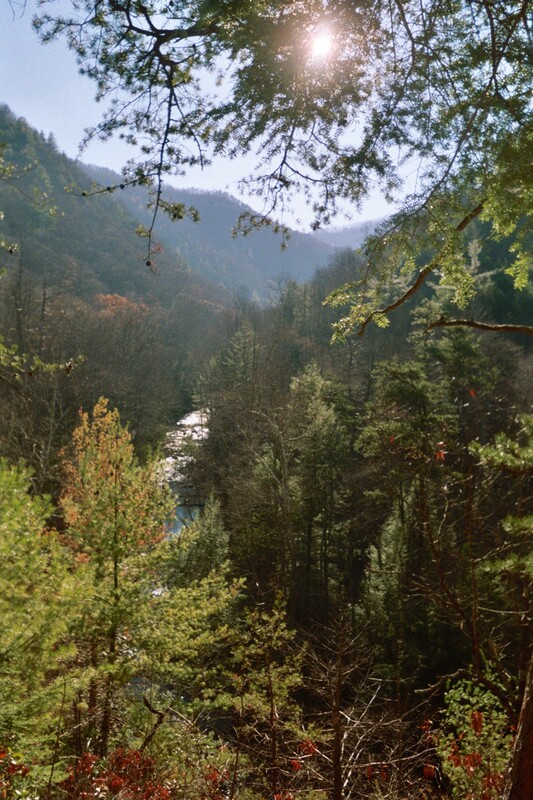 The highlights of the Trail in this part of Tennessee are Laurel Fork (see left), a beautiful gorge featuring 40-foot waterfalls and the adjacent Pond Mountain, featuring expansive views from its bald flanks. From here the Trail follows the ridgeline of Holston Mountain, then descends into the welcoming Trail town of Damascus, Virginia. Big mountain hiking right along the spine of the Great Smoky Mountains — what’s not to like? You’ll want to be in shape for this one. There are a lot of ascents and descents along the route. We went in late fall to avoid the crowds, which worked out spectacularly. Plan your trip well in advance. NOTE: To qualify for an AT Thru-Hiker Permit, you must begin and end your hike at least 50 miles outside Great Smoky Mountains National Park and only travel on the AT in the park. (This section starts 30 miles outside the boundary, so you need to obtain a backcountry permit.) See regulations here.